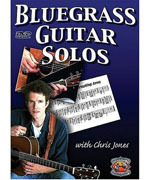 Take a bluegrass guitar lesson in the comfort of your own home with a guitar DVD from Lakes Music and PlayBetterBluegrass.com. Don't pull your hair out trying to find a bluegrass guitar instructor. A lesson on DVD is a great way to learn. 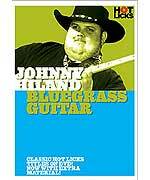 Plus, with a bluegrass guitar lesson DVD, you can replay your lesson anytime if you missed something. And the cost of a guitar lesson DVD is only a fraction of what it will cost with a bluegrass guitar instructor. Subtitled "What the Tab Won't Tell You," this DVD and its accompanying transcription book are designed for the guitar player who already has some knowledge of guitar chords, rhythm, and perhaps even lead styles outside of the flatpicking realm (fingerstyle, classical, blues, rock, etc.). If you already know how to play the guitar, but are not familiar with the flatpicking style and repertoire, then this DVD is for you! Legendary guitarist Norman Blake teaches flatpicking fundamentals and a variety of bluegrass and old-time country guitar techniques that have made him a hero to acoustic players everywhere. He explores arrangements for several favorite songs and instrumentals from his repertoire, discussing back-up technique, use of the capo, special tuning and lots more. 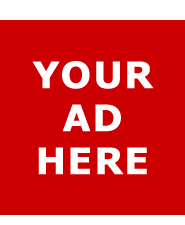 Songs: Whiskey Before Breakfast - Gray Coat Soldiers - Ginseng Sullivan - and more. 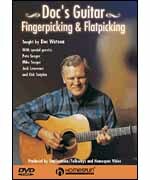 Norman demonstrates guitar techniques, musical ideas, playing style and ten great songs and instrumentals taken from his vast repertoire: Coming Down from Rising Fawn - Caperton Ferry - Uncle Joe (Miss McLeod's Reel) - Old Virginia Reel - and more. In this 2-hour video/DVD from bluegrass guitar veteran Tim Stafford you will learn the fundamental skills that will make you a better guitar player no matter what your current ability level. Learn the guitar techniques that helped change the role of the guitar in bluegrass music from the masters - James Alan Shelton and George Shuffler. This video begins with James Alan Shelton picking a tune with the legendary George Shuffler. James then interviews George regarding the development of his "crosspicking" guitar technique. Chris teaches his 10 favorite solos & half-breaks from his recorded CD's. He plays each solo full speed with Sally Jones accompanying him on rhythm & singing tenor. Then he plays each slowly. Lastly, he discusses valuable details about the solo, to help your learning & understanding of the music.